As you remember, in our scenario, we will have two DC/OS clusters. One will be used to run the “Production” Docker containers and the second one for “Integration & Testing”. 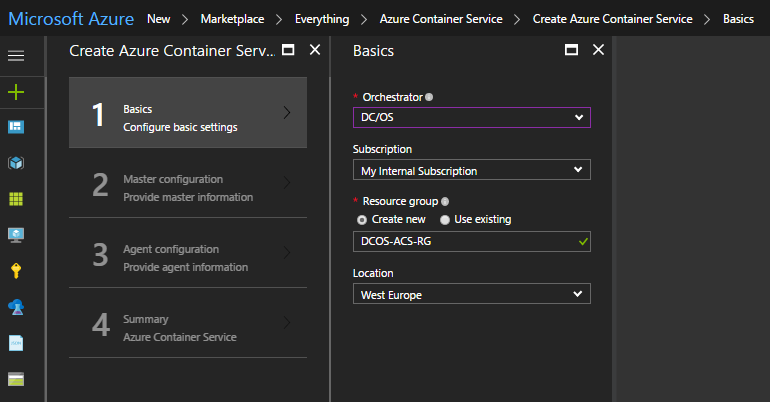 To deploy the cluster in Azure, we will use the magic of Azure Container Service which is a semi-managed containers orchestration platform. It supports all big-3 – DC/OS, Kubernetes and Docker Swarm. Unlike a manual on-premises deployment, ACS will do the heavy lifting for us. All you need to do is to state how many Master and Slave nodes you want and that’s it. Another major difference between ACS deployment and an on-premises one is that in Azure, DC/OS must be deployed with both private and public slave nodes. If you remember, in our vSphere based deployment, we didn’t install any public agents. Now, there are many blog posts, KBs and articles around how to use and deploy DC/OS using ACS so I’ll try to make it short but comprehensive as possible. IMHO, Microsoft ACS documentation is a very good place to start with.